Yesterday I formally shut-down my other website Betterverse.org. Betterverse has been a labor of love for the past three years, so I’m of mixed emotions about wrapping it up. 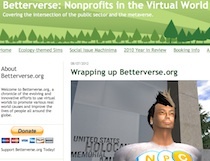 On the one hand, it’s been wonderful having an outlet for spotlighting all the amazing work that nonprofits, charities, companies and governments have been doing using virtual world technology. It seamlessly integrated into other work I was doing in virtual worlds for Global Kids, TechSoup and others. And it was for the most part enjoyable and easy. But over the past year, it started to feel like more of a slog just uncovering new stories and new angles on older topics. I think partly it was because the shiny new-ness of the technology was starting to fade. But also I think I my own interests have been drifting in other directions. In the past couple of months, I felt like I was doing it just to keep doing it, which is a terrible motivation for doing anything. So I resolved then and there to stop doing the old things that weren’t working anymore and to start doing more new things. I shut down one of my blogs, as a start. The new thing I’m doing this week is I’m taking a variety of classes at Athletic Playground, this awesome movement-based studio in Emeryville. On Monday, it was acrobatics. On Tuesday, handstands. On Friday it will be “monkey conditioning.” I don’t know what that is, but I can guarantee I will be sore afterwards. So far the classes have been really neat experiences with a small group of other students trying difficult and wacky things, guided by a supportive and skilled instructor. A typical class exercise: You fall forward into a handstand, fall out of it quickly cause that’s where you are. You try again, your partner catches you and helps you balance. You hold it as long as you can. The instructor corrects your posture and gives you tips. You do slightly better, and then fall down again. Rinse, repeat. Confronting my own fear of new things, of looking foolish, of failing has in the past always been a fruitful and vibrant mental place for me to be. It opens me up in ways that are uncomfortable, but often valuable. So I’m blogging less and falling more.